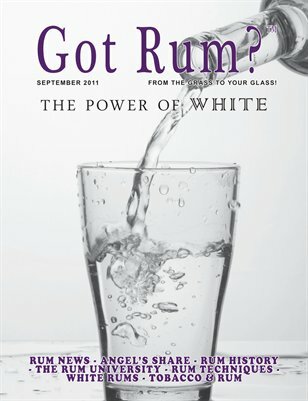 * The Editor’s Page- “White Rum or Sugarcane Vodka?” * World Rum News- Rum news from August. * Upcoming Events * Panama Red Rum Tasting and Seminar * The Angel’s Share- Featuring Railean Texas Gulf Coast White Rum(80-Proof),Koloa Kaua’I White Rum (80-Proof), Whistling Andy White Rum (80-Proof) and Ron Ricardo White Rum (80-Proof). * The Importance of White Rums * Rum In History- What happened in the month of September throughout history from 1522 – 1883. * USA Craft Rum Distilleries- a list of all rum distilleries throughout the United States. * Exclusive Interview- Interview with Mr. Peter Laurie and his book "The Barbadian Rum Shop: The Other Watering Hole". * The Rum University- This month we look at the Classifications of Rum- Part 6. * Rum Techniques- Covering the Organoleptic Assessment of Rum- Part 6. * Tobacco and Rum- Featuring Arturo Fuente Hemingway Short Story cigar and Panama Red Overproof rum.